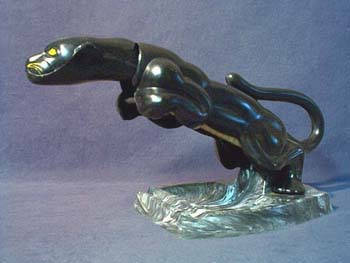 Sleek in his form, this bounding panther is actually a gentleman's plastic dresser valet. The panther's head pulls out to reveal a clothing brush. The swirl gray base is molded to provide a change holder, with a pen rest in front. The panther measures 14-1/2" long, 6-1/8" wide, and 7" tall. This handsome figural grooming item has one flaw on the seam under his tail and one glue flaw, also on his tail, neither one of which detracts from this great piece.